This week I haven’t managed to blog much as the toddler has been sick, not sleeping much and in my bed. Sleep deprivation and a need for many mummy cuddles balanced around work has been a real juggle! Today she has definitely been on the mend, which has given me some more time to get back into the kitchen. I had been sent some Gluten Free, Wheat Free Wraps to try and had been waiting for the right moment to knack up some fajitas. Today was it. 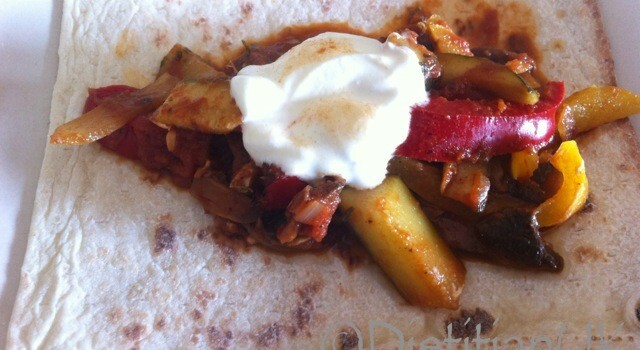 Fajitas are a firm favourite with by husband, but being wheat intolerant it requires a bit of effort on my behalf as I have to make my own wraps, having some ready made made it ten times easier. I really enjoyed them and the toddler took great delight in eating hers, making them into boats and planes – apparently she has my imaginative streak. They are also super healthy if you serve them with Greek yoghurt instead of sour cream and are a great way to get your veggies in! We served these with wheat free wraps for myself and normal wraps for the rest of the family. Finger licking good, even if i do say so myself. 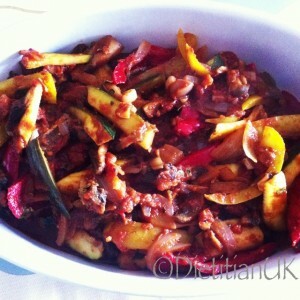 A delicious and simple vegetable fajita recipe that is wheat and gluten free. Heat the oil in a large pan or wok, add the onion and cook for a few minutes then add the garlic and spices. Allow the spices to cook for a few minutes. Now add the chopped tomatoes and let it simmer and reduce for a few minutes. Add the chopped vegetables (thin strips works best) and simmer. Then add the lime juice and red wine vinegar. Finally when it is all looking cooked add the herbs. 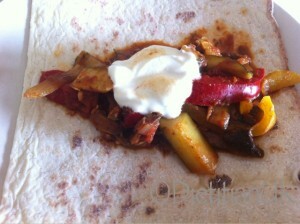 Serve with wraps, low fat Greek yoghurt and guacamole. What’s your favourite Mexican meal?